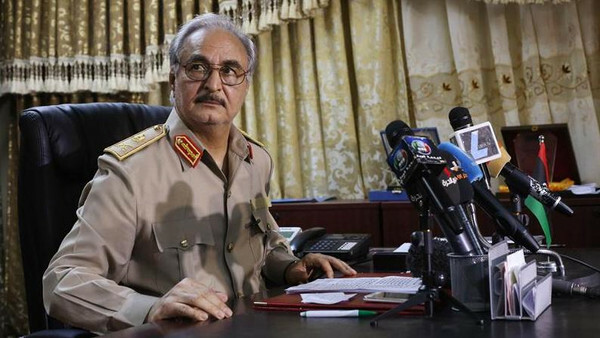 General Khalifa Haftar attends a news conference at Benina air base in Benghazi May 24. Forces loyal to renegade Libyan General Khalifa Haftar are stepping up an offensive against Islamist militias in Benghazi in a new push to recapture the city, sources told Al Arabiya News Channel on Wednesday. Haftar had announced he was ready to “liberate” the flashpoint eastern city, which has been besieged by an Islamist militia known as the “February 17 Martyrs Brigade” among others. Explosions and gunfire were heard in the city as the army’s tanks and planes carried out air raids against the militias in an effort to crush the Islamists, including the Ansar al-Shariah militia, which the United States has branded a terrorist organization. Haftar launched a military offensive dubbed “Operation Dignity” against Islamists in Benghazi in May, but with little success. In a speech broadcast late Tuesday, Haftar warned: “The coming hours and days will be difficult”. On a daily basis, clashes between Haftar’s forces and the Islamists have occurred. A spokesman for Haftar had earlier called on young people in Benghazi to secure their neighborhoods and to keep out Islamist fighters, saying the former general’s forces would enter the city on Wednesday. At least 22 people, including soldiers, have been killed in violence in Benghazi over the past 48 hours, according to military and hospital sources cited by Agence France-Presse. On Tuesday, seven soldiers were killed in a car bomb near the airport, according to a spokesman for forces loyal to the former general.